You are here: Home / Raw Islam / Raw Islam 59: How Much Do You Really Rely on God? 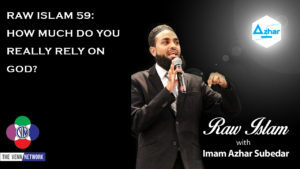 This week on the Raw Islam Podcast with Imam Azhar– a 2017 Podcast Award nominated podcast, we ask how much do you really rely on God? In the last few weeks we have seen people harm themselves and other at the Kaaba, and another try to set it on fire. In America there were protests across the nation, about 750 of them, for kids that are being torn away from their parents at the borders. And even in Boise, Idaho a man went on a rampage stabbing refugees, killing a three year old boy. Imam Azhar reminds us that the birds leave the nest in the morning to search for food, and God provides it for them. He provides so much that the birds have enough to bring home to the baby birds. And if a bird can have that level of faith, why can’t we?